Located at the Grand Wailea on Wailea Beach in South Maui. PREMIUM seating in the first two rows for the dinner show. Pre Luau: shell lei greeting, Hawaiian music, open bar, Hawaiian games, craft and lei making, tattooing. Lighting of the tourches and unearthing of the 'Imu' pit where the pig is cooked underground. Huge buffet dinner with many Hawaiian delicacies and an open bar. Families may want to choose the Premier Package for the closer seating at the Grand Luau at Honua'ula and for the reduced infant rate if more than 2 infants ages 0 - 5. After receiving a shell lei greeting a photo opportunity is available for an additional fee. As the sun sets enjoy Hawaiian music an open bar featuring blended tropical drinks such as chi chis, mai tais and pina coladas and watch as the village comes to life! Witness Hawaiian games, craft and lei making even tattooing for a sense of the Hawai'i of yesterday. Guest participation is encouraged. 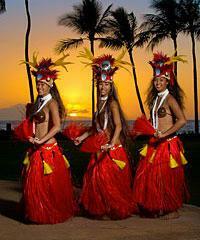 Dancers will entertain with traditional Hula "dance". Next the lighting of the torches and the sound of the conch shell invites all to experience the anticipated opening of the imu "underground pit oven". The cooked pork is toted off and served with your traditional Hawaiian buffet style dinner along with a variety of Hawaiian favorites. 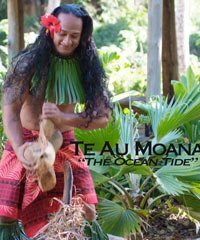 During the dinner show learn about the Voyagers of the Pacific, the legend of Pele, the goddess of the volcano. Meet the goddess Lilinoe, who resides high above the majestic peak of Haleakala, as well as the gods and goddesses of the ocean. Behold the beautiful story of the goddess Na'ulu as she glides through the heavens. Who are the menehune? Magical people who appear from the shadows and get into a little mischief by firelight. These stories combined create an exciting evening of traditional chant and hula, bringing the history of Maui to life. The evening comes to an end with a hot performance by the three time world champion fire knife dancer Ifi So'o. Equipment: Hawaiian imu (pit oven). Lavish dinner buffet with imu baked Kalua Pig, lomi lomi Salmon, grilled Teriyaki Steaks, macadamia sauteed Mahi Mahi with lemon macadamia nut butter, and salty sweet shoyu Chicken. stir fried Vegetables, island style Fried Rice, fresh Poi, baked Molokai (purple) Sweet Potatoes, green Papaya salad with lime and cilantro, Cucumber Namasu salad, Potato and Macaroni salad, a Maui grown Lettuce Bar, sweet Bread Rolls with macadamia nut Butter, Maui Gold Pineapple and Kula Strawberries. Water and Assortment of beverages are available. and chocolate brownies topped with macadamia nuts. This menu is subject to minor changes by the chef. blended tropical drinks such as Chi Chis, Mai Tais and Pina Coladas. Inclusions: Open bar, premium seating in the first two rows, dinner and show. This activity is accessible by wheelchair and walker. Restrictions may apply. Exclusions: Photos will be available for purchase. Restrictions: A cart pick can be requested at the front desk by guest with walking difficulties. This tour has a 48 hour cancellation policy. This means that once you're within 48 hours of the start time, the tour is non refundable. If you choose to cancel before this time, the standard 3% cancellation fee will apply. If the vendor needs to cancel your tour because of weather, a mechanical issue or any other reason you will receive a 100% refund of the price you paid. There have been 8 reviews written about the Premier Luau Package with Grand Luau At Honua'ula. It was a nice Luau. Food was good, show was excellent. Highly recommend. Get in line early for better seating. Was a nice show and dinner. We love this luau, and have been several times, at several different venues. The setting is gorgeous, the show is wonderful, and the food is very good -- it gets better each time. We highly recommend the premier seating for the best view of the show itself. Excellent show!!! I paid extra for seats up front. Well worth it. For the extra price, including the picture would have been nice. An additional $25 for 1 picture was a bit much. and during dinner. The food was good but servers cleared it almost immediately. A cart pick can be requested at the front desk by guest with walking difficulties. This tour has a 48 hour cancellation policy. This means that once you're within 48 hours of the start time, the tour is non refundable. If you choose to cancel before this time, the standard 3% cancellation fee will apply. If the vendor needs to cancel your tour because of weather, a mechanical issue or any other reason you will receive a 100% refund of the price you paid.